“The Simpsons have entered the forest.” – Lisa. Never liked this episode, never will. 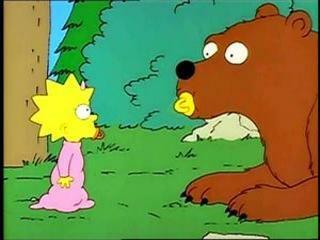 Really, the only redeeming quality is the whole plot of Maggie ingratiating herself into the family of bears. Which, I think, is the first instance of yet another of my favorite long-running Simpsons tropes: the animals are smarter than the humans. The rest, though? Oy. Yes, it makes sense for Homer to buy an RV cos Flanders has one. And yes, it makes sense that it’s going to be awful, cos he couldn’t afford a nice one due to his credit. But the second they hit the forest, the RV plotline falls off a cliff, replaced forever by a series of unfunny camping jokes, climaxing with yet another “Homer is an ape” joke, as he gets covered in mud and mistaken for Bigfoot. During all of this – including Bart and Homer nearly freezing to death –it’s neither funny nor tragic, because none of the characters acts as if anything going on really means anything to anybody. Homer & Bart don’t worry about Maggie; Marge & Lisa don’t worry about Homer & Bart & Maggie, and the entire Bigfoot sequence makes no damn sense whatsoever. That there is a certain manic escalation to the Bigfoot sequence doesn’t really matter if you didn’t accept the premise, which I didn’t. It was too cartoony.